A policeman stabbed in the neck and chest while attempting to arrest a suspect is making "good" progress in hospital, police say. 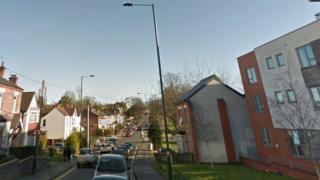 The West Midlands officer, aged 36, suffered two stab wounds when he was attacked by a man at an address in Wood End Road, Erdington, Birmingham. He underwent successful surgery on his neck wound on Tuesday night. A 48-year-old man has been sectioned under the Mental Health Act, police said. The wounded officer was part of a pre-planned arrest operation when he was attacked on Tuesday afternoon. Police said they had gone to arrest a man following allegations he had broken a neighbour's collarbone during an assault. Ch Supt Kenny Bell said the messages of support to the officer and his family have made a "huge difference" during his recovery.